As a nature enthusiast I&apos;m on the lookout for wildlife on any walk I take but I never go expecting to see anything in particular. Hoping, perhaps, but not expecting. Imagine my delight, therefore, when a recent walking holiday on the Isle of Skye unexpectedly turned into something of an eagle safari regardless of where I went or what I was doing. Scotland has two species of eagle, the golden and the white-tailed (or ‘sea’ eagle), and both threw themselves at me from every direction. Literally so during a visit to Duirinish when, after I’d spent two hours dozing motionless on top of a cliff, a golden eagle came and landed on a ledge insanely close to where I was lying. For once, I had the right lens on my camera and my camera was in my hand. In all my years of walking in Scotland I’ve never been so close to one of these magnificent birds, and it’s the first photo of an eagle I’ve got where the subject isn’t small, blurred or both! Remarkable as this encounter was, it was just one in an equally remarkable run of sightings the like of which I’ve not experienced before. In all, I saw 13 eagles across five days: three while I was sitting eating a sandwich atop the Red Cuillin; four while I was driving between Carbost and Dunvegan; one was being chased by a raven at Talisker; three were soaring above the cliffs at Neist Point; one was hunting rabbits at Waternish; and one was flying low over the ground in Glen Brittle. I’m not sure what the average number of sightings would be for your typical outdoorsy-type person on Skye in March but it felt pretty special to me. As I explored western Skye with an explosion of eagles all around me, I couldn’t help but ponder just how unlikely this sight might have been not so very long ago. Persecution of eagles was rife in the last few centuries, chiefly because of the threat that they (and other birds) were believed to pose to upland estates trying to maintain large populations of red grouse for their shooting interests, and to livestock on farms. As a result the golden eagle was hunted to extinction in England and Wales by 1850. Though a pair nested in the Lake District in recent decades there is now only one resident golden eagle south of the English border. A solitary Lakeland male, left on his own after his mate died in 2004. He now displays every Spring, looking for a female who might never arrive. Scottish Natural Heritage (SNH) cite the low point for the Scottish population as coming just before World War 2, at somewhere between 100 and 150 pairs. New laws to protect our wildlife mean things have improved considerably since then and there are now around 430 pairs of golden eagles in Scotland. The white-tailed eagle fared less well. The last nest in Southern England was recorded on the Isle of Wight in 1780, the last breeding pair in Northern England was seen in the Lake District in 1794, and Scotland’s last recorded nesting pair were seen on Skye in 1916. Total extinction in the British Isles finally came in 1918 when the last remaining white-tailed eagle was shot on Shetland. An inglorious end for such a magnificent creature. However, the species was reintroduced to Scotland in three phases over recent decades, using chicks from the Norwegian white-tailed eagle population. 140 of them were reared and then released on the west coast over 23 years: 82 on Rum between 1975 and 1985, and 58 in Wester Ross between 1993 and 1998. 85 were released on the east coast, in Fife, between 2007 and 2012. The first white-tailed chick to fledge in Scotland for 70 years arrived in 1985 on Mull. In 1996, the first chick born to a pair bred in Scotland arrived. And then, in 2013, a pair of white-tailed eagles raised and fledged a chick on the east coast for the first time in 200 years. Figures vary slightly as to how many breeding pairs of white-tailed eagles there are in Scotland right now but they all put the figure at at least 60 nationwide. 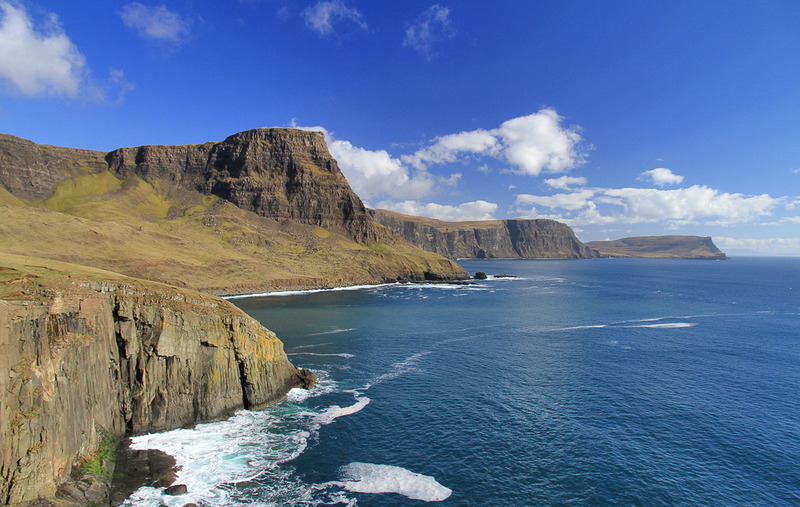 With its wild uplands and coastline, Skye in particular is a stronghold for eagles of both species with around 30 pairs of golden eagles and around a dozen pairs of white-tailed eagles. While it’s wonderful to see these birds recolonising their former strongholds, the recent poisoning incident in Easter Ross shows just how vulnerable to persecution our birds of prey are even now. 15 red kites and 4 buzzards have been found dead in a small area around Conon Bridge. 12 of those kites have been confirmed as dying from poison, a devastating blow to a local population that is itself the result of a long-term reintroduction programme. There’s clearly still much to be done to safeguard our birds of prey from those who would deliberately harm them, and for that reason it is wise not to disclose the location of nests if you happen upon them. We also need to consider the harm that can any of us could unwittingly do by disturbing the birds as we roam freely about the hills and coast. 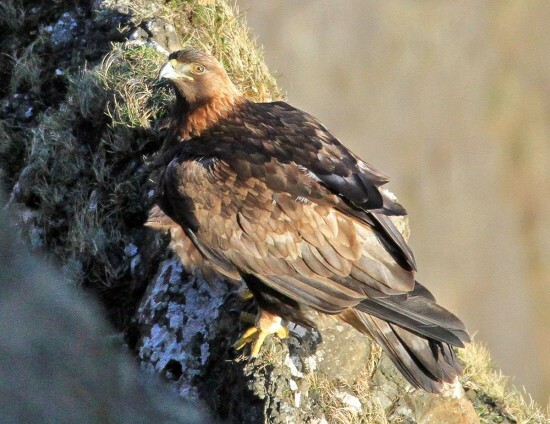 Golden eagles in particular are sensitive to human disturbance during the breeding season, from March to September. That coincides with the tourist season, and finding the balance between the two is difficult. But while we should all be cautious we should also take heart that these species have recovered at all. Experiences like the ones I had on Skye last month make me realise just how fortunate we are to have wild places above which eagles still soar. 1. Some buzzards really are quite large. 2. People don’t realise just how enormous eagles are. 3. People REALLY want to see an eagle. Another helpful feature is that both of the eagles have very long and obvious ‘fingers’ (primary feathers) at the end of their enormous wings. Buzzards have ‘fingers’ too but they’re much shorter and, more often than not, are so close together that they’re hidden from view. It’s often said that if you have to stand and ponder whether or not a bird is an eagle, it probably isn’t. After you’ve successfully confirmed it’s an eagle and not a buzzard your troubles are only just beginning I’m afraid, because telling Scotland’s two species of eagle apart can be frustratingly difficult. You’d think the names might get you started but sadly not. Golden eagles aren’t necessarily golden, white-tailed eagles don’t necessarily have white tails, and ‘sea eagles’ are sometimes seen in the mountains. Add to that the plumage differences between adults and juveniles and the fact that some golden eagles are coastal birds, and you’ve got something of a challenge on your hands. Don’t despair, though, because they are different in appearance. The sightings most of us are likely to get are those either from afar or from below. Silhouettes and profiles rather than close-ups in full colour. In those circumstances the size and outline of the wings and tail are the best things to go by. White-tailed eagles are sometimes called ‘flying barn doors’ because of their starkly rectangular shape. Golden eagles ­have a similarly impressive silhouette but it doesn’t look so plank-like. It’s got more curves to it and the wings aren’t as broad. Golden eagles have small heads relative to their longer tails, while white-tailed eagles have large heads relative to their shorter, usually diamond-shaped tails. Another reliable thing to look for is the angle the wings are held at when the birds are soaring. White-tailed eagles hold their wings flat in an almost straight line whereas golden eagles soar with their wings raised into a slight V-shape. Bear in mind that these are only very general guidelines, as an eagle’s appearance and outline can change depending on what it’s doing. There are plenty of other things to look for, and this handy and brief picture guide from the RSPB neatly sums up the differences between eagles and buzzards. If after a sighting you’re still unsure about what you saw, there’s no shame in falling back on the opinions of people more proficient or experienced than you. I certainly don’t hesitate to do so, as eagles aren’t things I see every day! Becoming proficient at any wildlife identification requires regular practice, and that’s not something most of us can expect to get with creatures as relatively scarce as eagles. Many thanks to wildlife artist Karen Hartnell for her valuable insights about eagle identification.